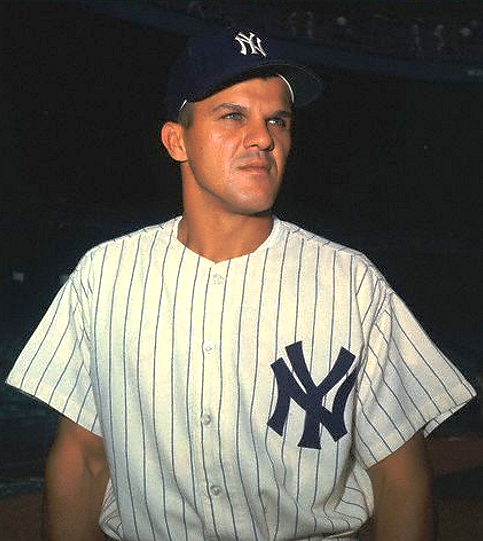 On this day 56 years ago, Bill Skowron outshone the likes of Mickey Mantle, Billy Martin, and Yogi Berra, slugging two home runs in a 10-7 win over Boston. His first dinger, yielded by Willard Nixon, led off the 2nd inning. It was an historic blast that not only cleared the left centerfield wall, but soared to the right of the flagpole and out of Fenway Park. A myriad balls have sailed out of Fenway after clearing the Green Monster in left field, but only 5 other other men in the 101 year history of Fenway have pounded a ball out of the park to the right of the flagpole: Jimmie Foxx (1937), Hank Greenberg (1937), Carl Yastrzemski (1970), Bobby Mitchell (1973), Jim Rice (1975). Skowron’s second blast, in the top of the 7th, cut the Yankee deficit to 7-6, before a Gil McDougald single tied it with 2 outs in the 9th. The Yanks won the game in 12 innings on a 2-run home run by Hank Bauer and a run scoring single courtesy of Mickey Mantle.